When the dust had finally settled on director Peter Jackson’s Return of the King, the final installment in his cinematic adaptation of J.R. Tolkien’s Lord of the Rings trilogy, many began to speculate if and when Jackson and his creative team would return to the fictional world of Middle-Earth once again to adapt The Hobbit, the precursor novel to Tolkien’s illustrious fantasy trilogy. After years of financial studio woes and debated legal matters, Jackson finally agree to helm the project, returning to his world of hobbits, dwarves, elves, and wizards in exploring the tale of Bilbo Baggins with a whole new film trilogy (beginning with The Hobbit: An Unexpected Journey and continue on with The Hobbit: The Desolation of Smaug). Now the final chapter in Peter Jackson epic retelling of The Hobbit comes to a dramatic conclusion in The Hobbit: The Battle of the Five Armies. Does this last installment bring closure to this fantasy adventure or is it an unsatisfying bloated blockbuster? After the destruction of Lake-town and of the titular threat of the dragon Smuag (Benedict Cumberbatch), Thorin (Richard Armitage) and his company of dwarves have reclaimed the Kingdom of Erebor inside the Lonely Mountain. However, the reclaiming of their homeland is met with horrifying ramifications as Thorin, consumed by a mental illness called “Dragon Sickness”, grows into a tyrant and desired to keep the mountain’s considerable wealth for him and his dwarven brethren. This is soon further realized when the people of Lake-town, seeking shelter and repayment for their losses, and the Elves of Mirkwood, come to Thorin to resolve past debts and are met with disdain and hostility. To make matters worse, Azog (Manu Bennett) and his legion of Orcs, Goblins, and Trolls are making a final approach on the mountain, attempting to gain a fortified stronghold for his master and wiping out the armies of men, elves, and dwarves in one fell swoop. Amidst all of this is the hobbit Bilbo Baggins (Martin Freeman), who is caught up in these greater events, torn between friendship, rightful action, and the hopes of surviving this terrible conflict. Given the fact that An Unexpected Journey garnished about 50 percent of The Hobbit book and The Desolation of Smaug took about another 30 percent off of that, Peter Jackson and his team delegated that the third film would be comprise of the last of 20 percent of The Hobbit. Much like how Harry Potter and the Deathly Hallows Part 2 was structural setup, this movie is mainly about the climatic “end” battle and its inevitable resolution to the story. This is where the feature changed its name (dropping the original title of The Hobbit: There and Back Again) and went with The Hobbit: The Battle of the Five Armies, a more fitting name that suits this picture well. The result is a movie that entices you with large scale fantasy violence, touching moments from its characters, and a bit prolonged with frivolous filler content and battle fatigue. 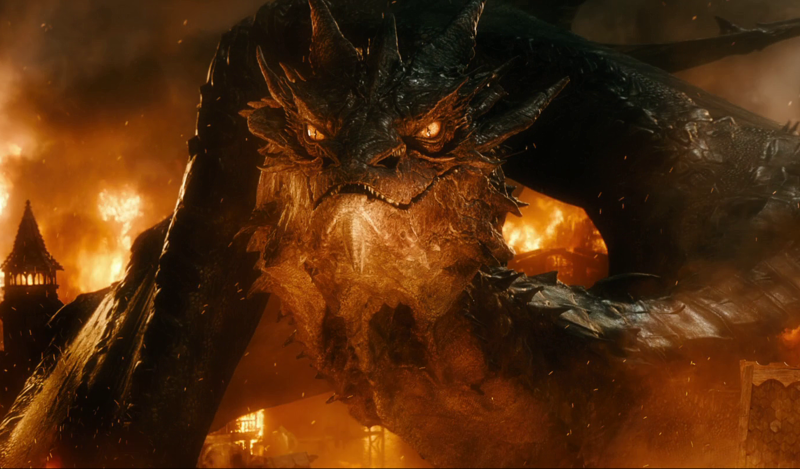 The film’s opening sequences of the dragon Smaug descending upon Lake-town certainly grabs a viewer’s attention and starts the feature with rambunctious bang of dragon fire and mayhem. Though the intent is there (and works well), this opening act seems a little bit wonky. For all its dramatics and noise, it feels like a finale of the previous movie rather than a defining standalone opening for The Battle of the Five Armies. Unfortunately, those expecting to see a lot more of Smaug himself will be disappointed with this “unfinished” business from The Desolation of Smaug dealt with quickly before proceeding forward in its narrative. 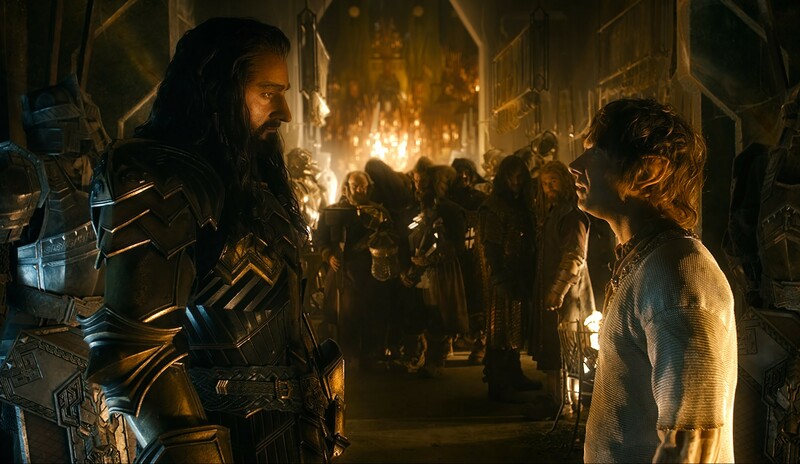 Like the previous two films, the main gripe for The Battle of the Five Armies is in its length. While it’s has shortest runtime of all six “Middle-Earth” films, the feature is still overstuffed with a little too much filler content that doesn’t really build upon the narrative or add momentum to the looming battle threat. Elongated shots and pointless exposition scenes should been cut and delegated for the eventual extended cut to quicken the film’s pace. One example of this can be seen in Ryan Cage’s cowardly character of Alfred. While I’m not denying Cage’s acting ability and his scenes of comedic levity in the film, his appearance, for the most part, is superfluous in almost all regards. He was a minor character in the book and, personally, should’ve stayed as such. The main attraction for The Battle of the Five Armies is the battle itself. It’s a vast set piece, in both scope and grandeur, with Jackson’s technical tactician approach for maneuvering the armies across the battlefield in brilliant execution. Visually, it’s impressive to watch and unfold with battles ensnaring men, elves, dwarves, orcs, and several with new creatures like the giant bats and the enormous worms. As the escalating battles of war are wage on every front, Jackson strategically places characters for smaller altercations that play out during these events. Several one-on-one battles are fought towards the film third act and are exciting and, for me personally, breathtaking to watch. Though, after awhile, a fatigue of numbness does set in on both the large battlefield and its smaller skirmishes, possibly outstaying its welcome. Amidst the battles, however, Jackson doesn’t lose sight of what’s important with touching poignant beats of friendship, loyalty, and, for some, love. The film’s roster of characters is solid with great performances all around. Like the previous movies, Martin Freeman does a great job in his performance Bilbo to only point where you should just simply wish he could have more screen time, whether it’s dramatic poise or comic relief. While Freeman’s character is suppose to be the main star of the feature (and of the trilogy), its Richard Armitage’s character of Thorin who truly shines during the course of this movie. He’s powerful presence on-screen and plays Thorin with such emotion and believability throughout his journey. Other notable supporting characters like Luke Evan’s Bard, Orlando Bloom’s Legolas, Aidan Turner’s Kili, Evangeline Lilly’s Tauriel, Lee Pace’s Thranduil, and Ian McKellen’s Gandalf also deliver exemplary performances with Jackson given their moments shine on-screen here and there. It is dismaying that most of the Thorin’s dwarven company (with the exception of Balin, Dwalin, Fili, and Kili) have little screen time, fading into the background with more of a physical presence rather than vocal characterization. There are a couple of nods and foreshadowing events that will, of course, be examined and further acknowledged in the next sequential trilogy aka (The Lord of the Rings). This includes Gandalf’s story arc and the appearance of the White Council (consisting of Elrond of Rivendell, Lady Galadriel, and Saruman the White) at the fortress of Dol Guldor, which wasn’t mentioned in the book, but happened elsewhere (off-stage). 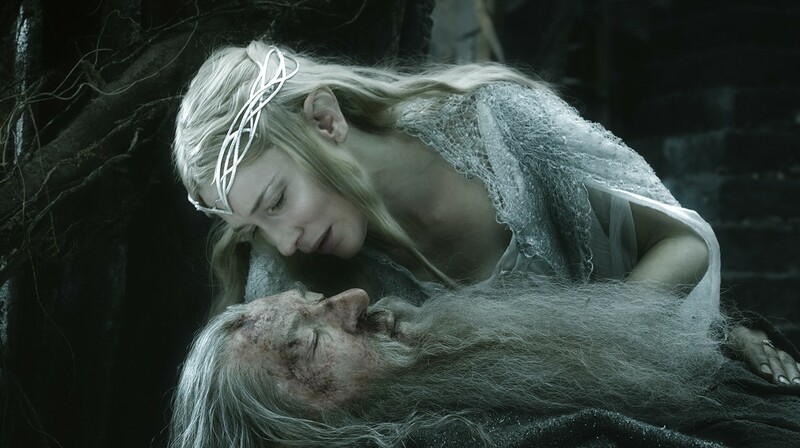 This scene was a unique one, showcasing the terrifying extent of Galadriel’s power, the ghostly appearance of the Nine Ringwraiths, the enduring sprit of Sauron, and a very vague notion of Saruman’s soon-to-be allegiance with Sauron. Others nods include name dropping of main characters, place and locations, an item or two, and the film’s final shot that plays out in the beginning of The Fellowship of the Ring. Finally, I never really cared for the two previous ending credits songs (Neil Finn’s Song of the Lonely Mountain and Ed Sheeran’s I See Fire), but the song used in the ending credits for The Battle of the Five Armies titled The Last Goodbye is worth mentioning. Sung by Billy Boyd (the actor who played Pippin from The Lord of the Rings trilogy), this song is both a touching and a fitting tribute to close off The Hobbit trilogy off and perhaps Jackson’s cinematic tale of Middle Earth. Many out there (Tolkien purists and average moviegoers) will continually debate on which Middle-Earth film trilogy reigns supreme. Whether you love it, hate it, or fall somewhere in-between the two, Peter Jackson’s elongated trilogy for The Hobbit was done and completed his way, creating both cinematic glory and disgruntled frustration along the way for its fans and viewers. The Battle of the Five Armies works well for what it is; a grandiose finale with alluring visuals of fantasy action, solid acting performances, and a conclusion of one tale and a sequential link to another. To me, it was great final installment for a trilogy that, while not quite perfect and still can’t measure up to The Lord of the Rings trilogy features, still retains its fundamental nuances of past entries and delivers a satisfying and entertaining ending. In truth, it was a great pleasure to return to Middle-Earth and to see, through its spectacle and grandness, Bilbo Baggin’s great adventure reimagined on the big screen. I truly felt like I was there…. and back again. It’s fine. Just like the rest of the trilogy. As unnecessary as it may have been. Good review Jason.